Speaking valves were a subject that as an #slp2be I hardly touched upon in grad school before entering my clinical fellowship year. As a graduate of a medically-oriented graduate program, I was very lucky to have the opportunity to gain some experience working with adults with speaking valves post-tracheostomy and post-respiratory failure. However, when transitioning from working in acute care with adults to sub-acute care with medically fragile children, my whole approach changed. This is specifically for toddlers and school-age children on tracheal collar support and on various levels of ventilatory support. 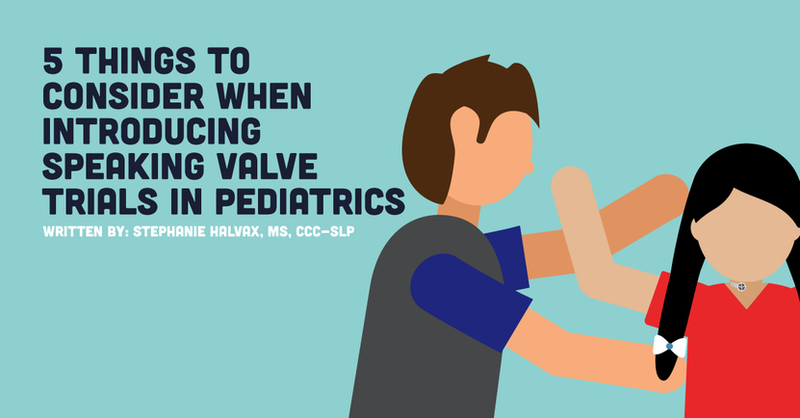 One of the biggest challenges in trialing and introducing speaking valves to the pediatric population is that there are many factors to consider when assessing if the child is not tolerating the valve. Unlike the adult population, children are not always able to tell you what is causing discomfort when there is any physiological or anatomical impedance. It can be very difficult to tell a true intolerance from a behavioral response resulting from the new feeling of the speaking valve. Working closely with your pulmonary and ENT teams can allow you to rule out physiological and anatomical roadblocks and avoid creating future behaviors (i.e. pulling valve off, decannulation, and refusal to don speaking valve). It is important to have both your pulmonologist and ENT clear your patient prior to speaking valve trials, especially if you are working with a child who has a history of airway stenosis, airway collapse, and respiratory failure. Many times these professionals may offer insight into ways to improve tolerance to speaking valve placement (i.e. downsizing the trach, changes in medication, changes in respiratory support). Specifically with children who are on ventilatory support, working with your pulmonology and respiratory team is crucial in order to find the perfect ventilator settings to gear the child up for successful trials. It is important that as SLPs we know our role is to advocate for our patient, but we also have to recognize the boundaries of our scope. Having a close partnership with your specialized physicians is invaluable to determine candidacy prior to trialing and creating a treatment plan for the child. Parents can be a great asset in preparing children for initiation and carryover of speaking valves. Personally, I feel that airway management and the introduction of speaking valves is one of the most specialized and life-changing things we implement as SLPs. I have seen parents become totally speechless and cry tears of joy when hearing their toddler or child vocalize (even if it’s a cry ☺) for the first time. Providing thorough education to parents regarding the benefits of a speaking valve before introduction allows them to advocate for their child. I have found that the more I educate patients’ parents regarding the pros of wearing a speaking valve, the more they are able to see the importance in advocating for the wearing of a speaking valve as a goal for their child. This knowledge is especially important if a pulmonologist, ENT, or respiratory team is not in the same facility as you or if you are seeing this child as an outpatient. There are some great apps and tools provided by Passy Muir Inc. that provide videos, anatomical diagrams, and pro/con lists so that parents can feel comfortable in their decision to pursue a speaking valve. The apps that I have found to be most helpful include the Passy Muir TRACH TOOLS App and Pediatric Tracheostomy app. If you are working with a child who is cognitively intact and able to participate in therapeutic planning, I feel that it is very important to explain the speaking valve to them. Building trust with your patient prior to placement is important, especially when many medically fragile children undergo multiple surgeries, doctor appointments, and medications. Many times the introduction of things to their trach has been known to be painful or uncomfortable. I have found the use of the Passy Muir "Tracheosaurus" as well as other dolls with trachs to be helpful in explaining the process of placing and removing speaking valves. I have also used educational videos on YouTube of other children wearing speaking valves to show examples of voice production. By educating the child, you are able to build trust and facilitate a therapeutic relationship. This will allow them to trust you as you think through improving their tolerance to wearing a speaking valve. What is the child’s respiratory status at baseline? What is the child’s respiratory status during more difficult fine motor and gross motor physical tasks? Do they hear any leak phonation or attempts to vocalize during their therapy sessions? Are there any supports in place to allow for the child to be in a comfortable upright position or improvements that can be made to the child’s seating system? PTs and OTs are often interested in speaking valve tolerance as well, since there is significant evidence that supports the wearing of speaking valves as a way to improve gross motor abilities (think soda pop can model). Working with them will provide you with the information needed to ensure that your patient is at his/her most optimal position for trials and allows you to encourage wearing across therapeutic tasks to improve patient outcomes across all domains! For many of these children, leak phonation (i.e. phonation over the trach) is heard prior to placement of the speaking valve if they have appropriate upper airway flow. When you are working with the child, keep track of times when you hear vocalizations. Is it when they are in a music/dance group? When their mother/father is playing with them? When in a therapeutic activities group with Recreation? These instances can give you insight into times when it may be the most appropriate to trial a speaking valve or when the valve should be worn to increase wearing time. Many times successful wearing of the speaking valve occurs when the child is involved in an activity that motivates them to use their voice. What is more motivating than getting to hear your voice in a nursery group or music therapy group and having everyone clap and cheer for you? Consider assessing these times when you are creating your treatment approach and using these activities during early valve trials. Introducing activities where your patient can hear and acknowledge their voice, even if they are only producing low intensity leak phonation, will give you the opportunity to praise their voice production. The patient will also see the communicative importance in using their voice without the discomfort that may accompany early speaking valve trials. I have found that this has given my patients a greater chance of vocalizations when we begin trials with the valve. I use these activities during initial trials to provide the child with something familiar. Using apps that imitate voice production, speech intensity modulator apps (i.e. apps that have designs when voice is present versus not such as Voice-o-meter and Bla Bla Bla), or turn-taking apps/games that encourage vocalizations (i.e. Talking Tom, Talking Pierre the Parrot, Talktime with Tucker, and Tiger’s Tale) are great examples. This may lead to less head turning, swatting, and removal of the valve during your initial assessment. By experimenting with vocalizations and occluding the trach to vocalize as appropriate, you can alleviate fear and show that using their voice is rewarding! By completing these tasks prior to speaking valve trials with the pediatric population, you are setting your patient and yourself up for a successful trial and treatment plan. The introduction of speaking valves is something that requires appropriate education and a strong working relationship between all disciplines and the patient. As SLPs, our knowledge of anatomy, speech science, communication, and behavior means we are an essential part of the airway management team. Working with children on airway management requires creativity and pre-planning. We are lucky to be a part of this process; there is nothing more rewarding than the look on a toddlers face when they discover their voice for the first time!